José Trías Monge was the Secretary of Justice (aka the Attorney General) of Puerto Rico. He later became a senator, then the Chief Justice of the Supreme Court of Puerto Rico. Monge was the chief architect, writer, and advocate for the document which became the “constitution” of Puerto Rico. Monge oversaw the entire “referendum” process that authenticated this constitution, and the “commonwealth” status of Puerto Rico (aka Estado Libre Asociado, ELA). Monge then testified before the US Congress, and before the United Nations, that Puerto Rico was now a “commonwealth” and no longer a colony. He betrayed the Puerto Rican people with a farcical, lying “commonwealth” document, and enjoyed the benefits of this betrayal, throughout his entire life. He was rewarded handsomely for this betrayal, with one government sinecure after another. Attorney General…Senator…Judge…Chief Justice of the Supreme Court! In the last years of his life, Monge performed a world-class volte face and admitted that Puerto Rico is a colony! 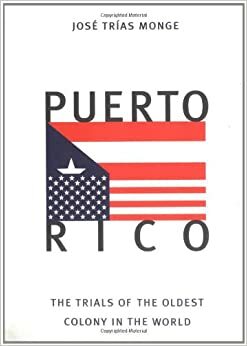 Puerto Rico: Trials of the Oldest Colony in the World was published in 1997 by the Yale University Press. Monge had allowed thousands of Puerto Ricans to get arrested and go to jail under Public Law 53. He helped the FBI to develop secret “carpetas” on 100,000 Puerto Ricans. He allowed Pedro Albizu Campos to be tortured for years in La Princesa, just three hundred feet away from the Governor’s Mansion. José Trías Monge’s deathbed conversion earns him a great distinction: he is the Sammy Glick of Puerto Rican politics. He finally admitted the truth, just in time to meet St. Peter. Redemption is the way forward, while leaving bloody footprints…. So many Benedict Arnold,that betray their own people. After selling their souls and squandering their evil income, at the end of the line when St Peter is knocking on the door, they suddenly ask for redemption. ( redeem their coupon).They spread so much suffering on a people and then they want a discount.